Super-tough clear waterbase polyurethane for use over acr ylic or waterbased paints. Protects from sun, wind and rain. Nontoxic. A versatile tool for defining edges in paint, placing paint dots, creating fine paint lines, etc. Also useful in embossing, etching and pottery. 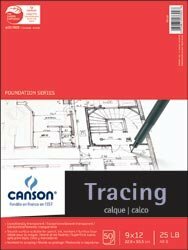 View Large Image Canson Tracing Paper Pad 9"X12"
Economical tracing paper with a fine surface, highly transparent. Ideal for sketches, preliminary drawings, and overlays in pencil or pen. 25lb, acid-free. Clear, water-based product that can be mixed with acrylic paint to help control bleeding of colors and easy application and flow of paint on fabric. Also, helps color penetrate fabric fibers. View Large Image Essentials Palette Paper Pad 5"X7"
The perfect size for your purse or backpack. 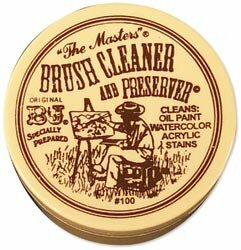 Suitable for use with oil and acrylic paints. 37lb weight. Greaseless, waxless, erasable and smudgeproof. Will not bleed through paint. ROYAL BRUSH-Royal & Langnickel Graphite Paper. 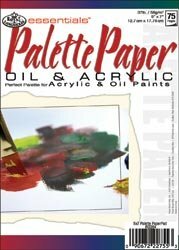 Use this ultra thin paper to transfer patterns onto wood; paper; metal and more. This package contains four 13x9 inch sheets of White Graphite Paper. Imported.